Welcome to the concluding session of “All I Really Need to Know I Learned While Skydiving… or, Top 10 Reasons Why Skydiving Is Like Social Media.” Glad to have you all back… the first post generated THE MOST traffic this blog has ever seen, and the most RTs on Twitter @replies, comments, emails, you name it (thank you PRDaily of course for linking to part 1). One quick side note, I do feel that one of the most important parts of a sound social media strategy is LISTENING (cc @GaryVee) but, despite what you’ve seen in Point Break or Cutaway, you cannot hear another skydiver during freefall. 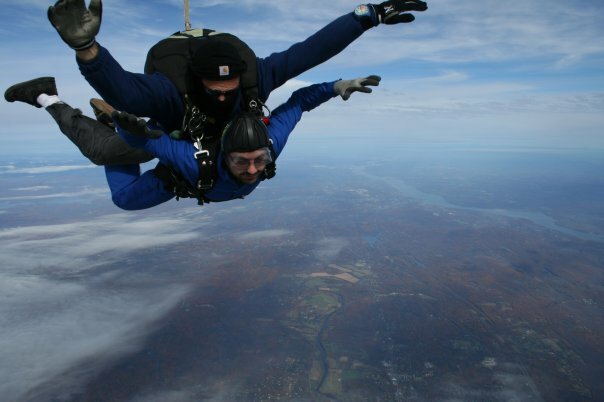 The wind traveling past your ears at well over 100mph pretty much makes you deaf to all sounds… as much as I tried to connect and spin it to compare to Skydiving, I couldn’t… so, consider yourself unspun. #6) Empower and give kudos! – SD: Without a few minor exceptions, every single person I met through and while skydiving have been just about the most welcoming people ever. From offering lighthearted jokes to ease the nerves (“I promise you, we will wind up back on the ground…”) to offers of joining the crew around their weekend bonfire, and the constant reminders to smile while the camera is on you during freefall… the continuous high-fives, hang looses and rock on hand gestures only fuel this impression. 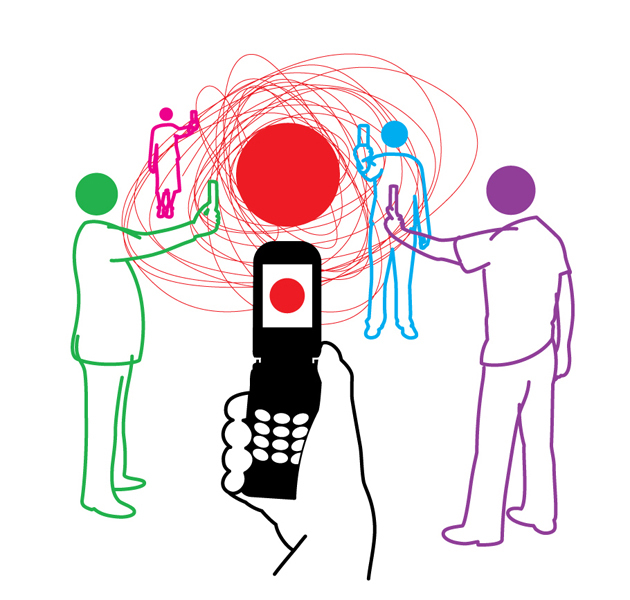 – SM: Social media really only works when you are being generous to those you interact with. Self-promotion isn’t a crime per se (depends on how you do it sometimes it’s not even a faux pas), but things can truly take off when you give others the plaudit and spotlight that everyone (who tries at least) deserves. 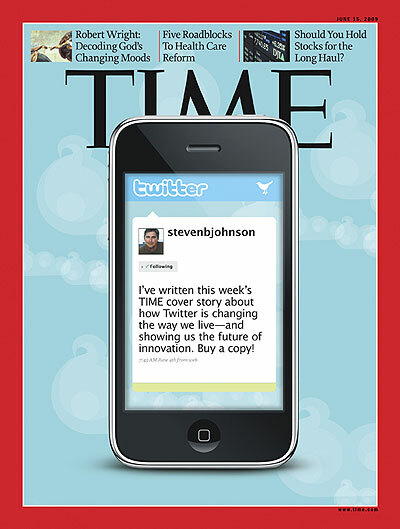 The “RT-culture” – as well as the adoption of the new RT feature – on Twitter showcases how far giving credit can go in the social media space. 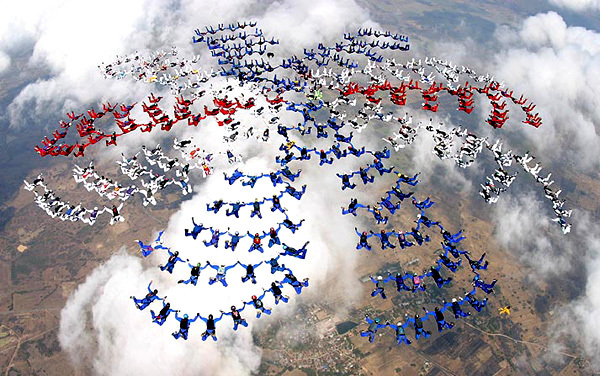 – SD: Even if not jumping with a large group (like my headline photo) to create record breaking formations during free fall, the process of skydiving is incredibly thorough, meticulous and involves team work across various levels. From the pilots, the parachute packers, logistics admins on the ground, teachers/trainers, and of course to the Tandem Masters themselves… frankly everyone at the dropzone work like a well oiled machine, if you do not see that on the ground, imagine what will happen up top. – SM: Again to echo CRUSH IT author Gary Vaynerchuk (@GaryVee), social media gives you the power to find those out there who are doing it better than you, then you can tap them, partner with them and mutually benefit… case in point: he ghost wrote the book (cause he’s clearly a video guy). Collaboration, as a catalyst for success, is not limited to social media or skydiving, it’s an integral part of a healthy social structure and of any winning strategy in sports as well. – SD: To play off #7 and #6, the skydiving community is one of the most tightly knit communities I have ever seen, and I’ve been in drama/improv circles, youth groups, cover and original bands, as well as an early participant in Facebook and Twitter… I will tell you this, the camaraderie I saw both on the ground, on the plane and in the air was unparallel. I think when you put your life on the line you understandably grow closer to the people involved. – SM: I don’t think there is anything to write here… if you don’t know that the community is the most important part of Social Media, I think you’ve stumbled on the wrong post/blog. The first step, whether in professional or personal brand building, is grow your community… the better you do it, the more success will come for you via Social Media. – SD: Your first skydiving experience (and key milestones in the future) has to be documented, how can it not? Sure, it’s pricy (genius business model by the way) but what about the memories, what about the conversation, what about the chest thumping self promotion!? In reality though, like other major ‘coming of age’ events, this need to be documented for posterity… besides, imagine yourself being the coolest grandpa one day. – SM: In Social Media, video and pictures (as much as I hate to admit it) have been growing exponentially… here are some hard facts: According to a recently published UMass/Inc. 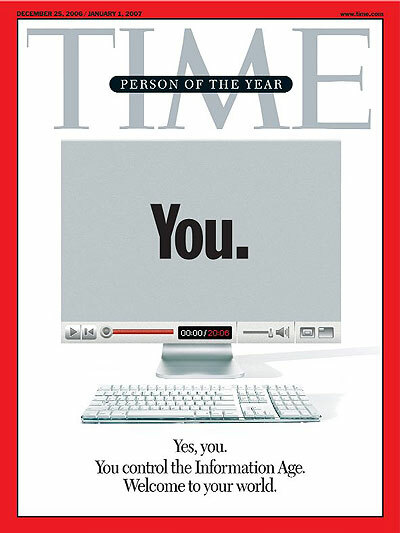 Magazine survey, in October alone, more than 77% of Internet users combined to watch 13.5 billion videos online, a metric that represents a dramatic shift in how consumers are engaging with content. Among even the most modest of predictions, 2009’s online video viewership is being estimated at 144 million and expected to grow to 188 million by 2013 in the U.S. alone. #10) When it goes right, it’s the biggest rush! – SD: The adrenaline pumping through my veins upon landing back on the ground safely is not something I can describe in words. The range of emotion is insane; from awe to shock, hysteric happiness to true disappointment that it’s over, and of course the rising addiction to do it again (right then and there). The phrase I was using, in a non morbid or depressing sense, upon finishing my first jump was: the earth seems kind of boring when you’re on the ground… *sigh*… Who’s in for a Skydive Tweet Up this spring?! – SM: While this pertains mainly to professional use of Social Media (i.e. on behalf of a brand, or as part of a Marcomm strategy), nobody would keep Twittering and Facebooking if it wasn’t for the recurring positive experiences. If you’ve ever seen your tweet, a blog post, a placement or whatever go viral through Social Media, you may have an idea of the rush I’m talking about here. On the professional side, the stuffy boardrooms I often work with on the Corp PR side are not ready for change for the sake of change… they need to test the water out, dip a finger in, see if it suits them and so on… the success of these baby steps is crucial if you want to keep your program, take it slow with the execs, they need to see success to get the rush. While working late on Sunday (after similar scenarios on Saturday, Friday, and so on) I was faced (literally) with a confrontation and a heated argument with an NYC cab driver. While I wasn’t backing down because of the rough night I was having already, my steadfastness was mainly attributed to the fact that what the cabby did was illegal – duty light on, stopped, asked where we are going, then decline and try to drive off. Just wanted to make sure I shared this to showcase a personal reprieve of Citizen Journalism (because I don’t really agree with the trend, but cannot deny it), because I saw it work and saw it work well. Looks like i will have to stop making fun of CNN’s iReport now, but I still can’t help to think that it is ruining investigative journalism… but on the other hand, it does now appear clear to me it has potential for diffusing confrontations on site. 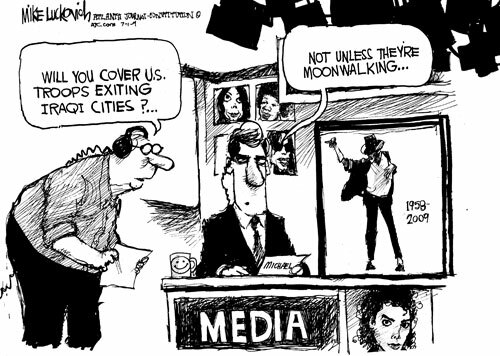 First, a reality check and an apology… The death of The King of Pop was a monumental media frenzy event that lent eyeballs for ALL types of media, not just the fledgling print and broadcast. So, while my original assertion was right that he helped bring back traditional media (even if for a short time), the reality is that even if a true rise in readership/viewership occurred, it would never be enough to bring back traditional media against its new, online counterparts. I will now apologize for making these exaggerated claims: I’m sorry my readers, I really am. Second, the real reality (meaning as it impacts me)… I shudder at the thought of calling my ‘work’ with Iron Mountain in a Concrete Jungle new media, but it literally is just that, a blog, if you will. Having said that, what really made me switch gears on my original assertion was the traffic that Michael Jackson generated for this blog… for me, it’s unprecedented (sure it’s my first true blog, but that’s semantics). Finally, the thank you… Since July 8th, I’ve received over 100 clicks on this post through search engines alone. In fact, “Michael Jackson” is THE most popular search engine term which was used to find my blog. Furthermore, my top 3 are: michael jackson, michael jackson clip art, google michael jackson… just for my lil ol non-blog-like blog…Mind blowing… which is exactly why I wanted to write this up and thank all those people for finding, visiting and reading my blog, as well as to offer them an update (and more things to search for). Every time my wife and I make our bi-annual trip back home to Israel, we especially look forward to visiting our relatives in the north for the usual great conversations, delicious dinners and amazing wine in the cool Golan breeze. Our last such dinner included several Hatzilim (eggplant) dishes, various spicy spreads, a Greek salad and fried red mullet fillets accompanied by Dalton 2008 Cabernet Sauvignon Rose and 2007 Sauvignon Blanc… and of course enlightening conversation about the very wine we were drinking. “Wine making takes a lot of patience, there is a huge amount of waiting,” started Binyamin “Beni” Sorkin, the famous viticulturalist (partly of Yarden, Galil Mountain brands fame) and Israeli wine industry consultant, our host and my uncle in-law. “It takes at least a case of beer to make a bottle of good wine,” he continued swirling the newly minted Dalton Rose… A wine coincidentally made by Naama Mualem, Beni’s oldest daughter. I’m not sure people outside the industry have ever measured good wine in the amount of beer it takes to create it… Sure, some folks are aware of the role of water in the manufacturing of wine (if taking glass and other industrial manufacturing processes into account), but the beer insight is new and more delicious. Figuring this would be a perfect theme to explore for this gracious guest blog post from Avi, my wife and I jumped in our rented car and headed to Dalton Winery to discuss it further with those entrenched in the process. Without question, the phrase seems to resonate with industry professionals but needs to be put in perspective. I asked Naama and Beni what exactly they are waiting for… in a world of automated harvest machinery and bottling process, hasn’t the process been sped up and not slowed down? “As the winemaker, I wait for everybody and for everything, including myself. From the perfect time to harvest, to the actual time that harvest gets in the gates to the winery from the vineyard, mashing and filtering, the bottling process, and of course the barrel aging” Naama notes. And because the harvest times are different for each varietal, each one of them goes through the process alone and you usually can’t combine bottling of a Sauvignon Blanc while mashing of Merlot is going on. “So the beer comes into play between stages of winemaking and every time the process has started.” She summed up, confirming her father’s assertion. Just like wine is often paired with a good cheese, a cold beer is always matched well with a game of Shesh besh (or backgammon). Naama made a point to mention that there is a lot of Shesh besh playing in between work. “In fact this year we launched a Shesh besh tournament. We are the first ever wine business in Israel to open such a league,” she boasts. While the league is currently open to Dalton employees only, Naama dreams of a country wide competition between wineries. Gaining this insight, we proceeded to the tasting, which as usual I can only describe as hedonistic given our familial leverage, tasting all thirteen 2008 bottles and with regional artesian cheeses, breads and spreads. This brings me back to the Dalton 2008 Cabernet Sauvignon Rose we had on our first night in the Golan… it was very refreshing, served somewhat cool but not cold. It embraced the spices in the spreads and home made olive oil, and yet the delicacy of the red mullet; it was the right wine at the right place and definitely at the right time. I recommend it immensely. Waiting can also be savoring, taking the time to enjoy something; it can also be looked at as anticipation… and here is where US consumers can relate. Because of Shmita rules (biblical agriculture laws mandating a break from harvest on the 7th year), Dalton will not be exporting the 2008 wines, so you may be sipping beer between now and when the 2009 vintages make it stateside. Good things come to those who wait, and the waiting time can be easily passed by drinking Goldstar or Guinness while playing a fierce game of Shesh besh. So, the kids are grown up all set to leave the nest together… and I’m not talking about Pam and Jim (yet), but rather social media (aka SM) and its sibling user generated content (or UGC). We all remember the TIME Magazine cover at onset of 2007 (gosh has it been THAT long?! ), and the more recent (June 2009) Twitter cover, proclaiming the arrival of UGC and SM into the big leagues… clearly, that train hasn’t slowed down since leaving the station. Last night, my wife and I (as the rest of The Office watching world) tuned in to perhaps the most monumental sitcom event since the end of the Seinfeld era (g’head argue otherwise)… finally, after years of torment, countless times of looking away due to Michael’s uneasy jokes, all the laughter, some tears etc etc… the moment came. There they were, our Pam and Jim… FINALLY getting hitched. What ensued was a spoof of the famous YouTube clip “JK Wedding Entrance Dance,” a home video that garnered over 27 million hits as of the morning after the episode aired. I have not seen the video above until after the show aired (I’ve since given up my residence under a rock), which is a sweet embrace of a special moment in the real couple’s lives (whom should also be commended for using their new found web-fame for charity purposes). It was mimicked nearly to the T by the Office crew (see the full scene here) as the ending of the highly anticipated episode. What I took away from this (because quite honestly it was rather anticlimactic for me and not any funnier than other episodes) was the fact that here it was, the top grossing sitcom around now ‘borrowing’ on the UGC movement, for an episode of this magnitude… seems risky (lazy even), but then again 27 million YouTube hits can’t be wrong, right? We all know that traditional media is struggling, and TV is no different. Reality shows are in-style for a reason; their lack of writing and acting staff along with other major overheads that’s pushing traditional media underwater… so where to turn other than into predetermined, built-in and established audiences? Besides even in TV terms 27 million people is a big share. So it’s understandable, but disappointing nonetheless, at least from the standpoint that fictional characters should have fictional lives. I would’ve liked to see, what Doc Brown of Back to the Future called, a parallel reality… a parody of The Office world itself, than our real life events. Also of note, when I started searching for the original video, I stumbled upon the below clip, which calls out several other ‘borrowed’ parody pieces within the wedding episode (puking scene, and the T shirt, both questionable according to the comments). Some food for thought though, pun intended. Where will this ‘borrowing’ trend net out? We’ll have to wait and see… and through the years of training we all received from Pam and Jim’s back and forth escapades on The Office, we can hold out for quite a while. So, to summarize and quote the touching ending to Jim’s rehearsal dinner toast… here’s to waiting! However snobbish or passé (perhaps even condescending) the term Foodie may seem to some, I consider myself one; I’m a foodie with my restaurants, my menu picks, my ingredients, my home cooking, my books, my TV choices… I just am, and not that there is anything wrong with that. Even though I babble about food and restaurants all the time, the one thing I refrain from doing is talk negatively about the service of a restaurant. To me the food and the chefs are the stars, so why bias people about décor or service if the meal is great… that is until recently when my mom, brother, wife and I were at Fig and Olive (Fifth Avenue location, the ‘new’ one; bottom line: I recommend the uptown location, food is the same) and had one of the worst services. So I decided to enact the age-old marketing perspective: negative experience = 10 people told vs. good experience = 3 people… I went to town, and told all who’d listen about it in addition to those I usually babble about food with. The other day I came up with (per search results) a cute term… Negatweeting, seemed to just roll off the tongue, quite self explanatory given the recent occurrences around me. I take the side of Amanda Bonnen (obviously) as well as that of Michael Arrington in these cases, and frankly everyone else that took a stand. It is the power of free speech, if not consumer power through preference and opinion, which is the foundation of American society… hence Michael Arrington wanting his case tried here and not in the UK, as it is now. And that perhaps is the problem with such outrage as my own at the legal system hamstringing free speech online… the internet, though democratization at it’s finest, is not a democracy. And so on… internet is not a democracy, it is a powerful populous tool that is used to spread information and opinion, but there will always be those who control the switch… and yes, there is a switch. Again, do I even need to link to yesterday’s Twitter/Facebook hacker slowdown/deny of service attacks? Seems quite reasonable of an argument to me. Thus, I decree: onward with your negatweeting my masses, go forth with your opinions and free speech consumerism. Use social networking and social media to bunch up and grow your numbers. Have your cake and eat it too, until they take away the fork. So go on, exercise the right to express dissatisfaction with things and make yourself heard through tools available… because if we don’t engage and define ourselves, someone else will or already is.